Energy efficiency at home is high on our list of priorities. However, we don’t want all the mess associated with installing regular insulating systems such as ripping the attic apart. Fortunately, there’s ATX Radiant Barrier & Insulation’s Radiant Barrier Spray solution. If you are looking for ways to effectively and substantially reduce the heat in your property, using Radiant Barrier Spray Insulation is the way to go. It allows you to protect your home from excessive heat without having to go through messy installation that sometimes takes days to complete. It’s also perfect if you need to add additional protection from heat in your home’s attic. Similar to regular radiant barrier insulation foil, radiant barrier spray works by preventing heat transfer between objects. The difference between regular radiant barrier foil and radiant spray is that radiant spray is directly sprayed on the roof deck, transforming the roof itself into a heat-resistant material. The treated roof transforms into an efficient heat resisting material. It reinforces the insulating properties of any existing insulation you may already have. Spraying your roof deck with barrier spray alone greatly reduces the attic temperature by as much as 20-24% when sprayed properly. You will enjoy instant protection against the sun, and after the first application the results can be observed almost immediately. Heat shield – If properly set up, radiant spray can deflect radiated heat by as much as 80%. It can work well with your existing insulation systems for a more effective prevention of heat transfer in your living space. Permeable – Radiant barrier spray is permeable. That means you don’t have to worry about humidity and moisture being trapped in roof decks and other treated materials. Quick and easy set up – Radiant barrier spray is one of the simplest and easiest to install or apply. Energy savings – You can save as much as 10-15% on your cooling consumption by treating your roof deck with barrier spray. Think about all the expenses you can save when used with other insulation systems. Increase your property’s market value – An energy-efficient property is a property with high market value. By installing barrier spray, you can increase your home’s resale value. Installation – The contractor sees to it that the rafters are also sprayed appropriately. Without doing so, thermal bypass could occur. Heat can pass through the part that hasn’t been applied with it. Proper paint ratio – Proper ratio should also be taken into account, because paint that has been very diluted could leave the barrier spray useless. Coverage – Spraying this product too thin will allow the heat to still pass through. Spraying it too thick could also have undesirable results. 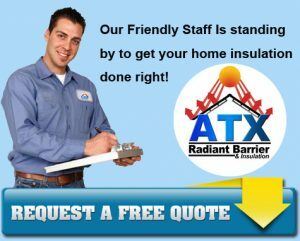 We take pride in ATX Radiant Barrier’s team of highly trained, skilled and experienced contractors who are some of the finest in Austin.